If you need to assemble a longboard, mount new trucks onto a deck, or even order replacement trucks, you need to figure out truck placement. How do you know if a given set of trucks is compatible with a given deck, and how do you figure out truck placement? Longboard deck and trucks manufacturers use two standards for mount hole patterns, called old school and new school. You need to ensure your deck and trucks have compatible mount patterns. Some decks have more than one pattern so you can choose how close or far apart you want to place your trucks. Truck placement affects wheelbase, which in turn influences stability and turn. RKP trucks can also be flipped to make your deck ride lower and with more stability. There is more than one way to place your trucks on a given deck. Also, not all trucks are compatible with every deck out of the box, though in certain cases you can drill holes yourself to achieve the desired result. New School pattern: holes are spaced 2.125″ lengthwise and 1.625″ widthwise – both patterns use the same spacing along the width axis. 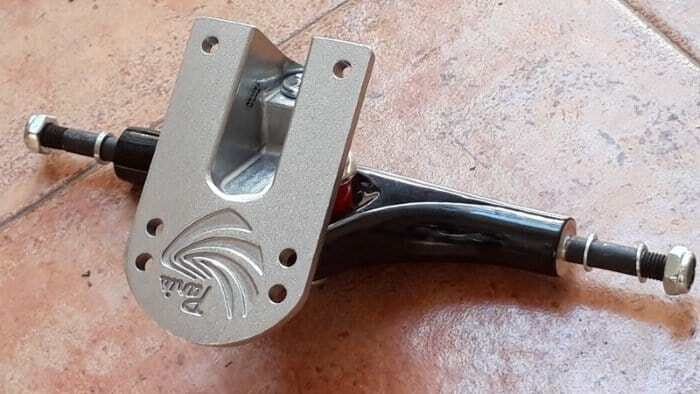 The New School mounting pattern became standard in the 80’s when the industry moved the outside bolts inward 3/8″ to avoid hardware hang-ups when tail slides and pool tricks became popular. Some re-edition longboard decks only have the Old School pattern, which limits you to using only “vintage” street trucks or certain longboard trucks with these decks. Longboard trucks often use the New School standard but many have more holes (e.g. 6 or 8) for matching both patterns and for allowing wheelbase adjustments (see next section). Most street decks i.e. traditional skateboards, on the other hand, are drilled using the New School pattern. 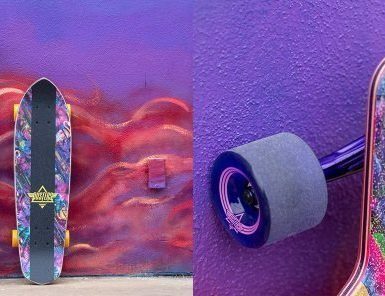 Likewise, street trucks (standard kingpin, SKP trucks) typically use the New School mounting pattern – although some street trucks have more holes due to the influence of longboarding. Mini Logo trucks, for example, have only one set of (New School) holes. Independent trucks 159 and 169, on the other hand, are double drilled for both old and new school. Gullwing trucks are also typically double-drilled. If your deck uses a combination of both Old School and New School mount hole standards, i.e. it has a 6 or 8 hole pattern, the truck placement you choose will determine the wheelbase – which is the distance between your trucks. Wheelbase is an important factor that affects the way the longboard rides – you usually see a longboard’s wheelbase size indicated alongside length and width as key data. Adjusting truck placement from one hole set to another can affect board flex, weight distribution, and even wheelbite. A shorter wheelbase typically gives you more turn as it decreases the turn radius of the board. Shortening the wheelbase may also decrease the board’s flex. Depending on the shape of the deck, moving the trucks inward can increase wheelbite by bringing the wheels to a position where the deck is wider, increasing the chance of contact between them in tight turns. Conversely, placing the trucks further apart, e.g. lengthening the wheelbase, can give you less turn and more stability at speed, but may result in increased flex on a flexy deck – possibly leading to more wheelbite as the deck bounces more. What if trucks and deck holes don’t match? Suppose you’ve ordered a new set of trucks just to realize the mount pattern doesn’t match your deck’s. Or, you just want to fit some old school trucks you like on a new deck but it only has a single set of (New School) holes, or vice versa. In other words, the mounting holes on the trucks are short of the holes on the deck (or vice-versa). An easy solution is to drill additional holes in the deck, or the trucks if there’s enough space in the baseplate. You don’t need to have a drilling template to do it, you can just mount 2 bolts through existing holes and use the other two as a drill guide. Have you ever wondered why longboards have their trucks backwards compared to regular skateboards? Skateboards typically use Standard Kingpin (SKP) trucks, which are placed so that the kingpin and bushings of both trucks face each other. Conversely, many longboards, particularly larger ones, use Reverse Kingpin (RKP) trucks in which the kingpin is on the opposite side of the axle and therefore points the other way compared to SKP. As a result, the trucks face away from each other and outward vs inward. RKP trucks are higher than SKP, making them more turny and responsive than SKP trucks. However, you can choose to “flip your RKP trucks”, that is make them face the other way (so basically the same direction as SKP trucks) which helps make the trucks lower and more stable, since you’re lowering the board’s center of gravity, but less responsive. Thus, flipping your trucks, which only works with RKP trucks, is an additional option you have for tuning your longboard besides choosing different hole placements. A common question closely related to longboard truck placement is what size longboard trucks should you choose. The size of the trucks you need depends on the width on your deck and should roughly match that width. The reason is that you don’t want your wheels to stick out too much from on both sides of your board. If your trucks are significantly wider than your deck, for example, you could easily get your foot caught on your trucks or touching the wheel, which would be very dangerous. Most longboard trucks come in either 150mm or 180mm size. For a deck that’s 8.5″ or narrower, choose a 150mm truck, e.g. SKP trucks (but not necessarily), or 180mm for a wider deck. As mentioned, changing your truck placement might bring your wheels closer to the deck and create wheelbite issues when turning. You can help reduce such issues by adding risers between your trucks and deck. The height of the risers you need depends on the deck and wheel size. For example, you may use 1/4″ risers for 58mm street-type wheels. For larger longboard wheels e.g. 71mm, you may use 1/2″ or 3/4″ risers to prevent wheelbite depending on deck size and shape – shapes with large cutouts are less prone to wheelbite. Truck placement is very important in tuning your longboard and finding the riding feel you seek. Deck shape and style and truck features determine mount hole patterns, which affect your placement choices. Other factors such as truck kingpin style and direction, and wheel clearance also play a role in where you place your trucks. Be sure to check your deck and desired trucks carefully before ordering or switching – or have a good drill and some riser pads handy!